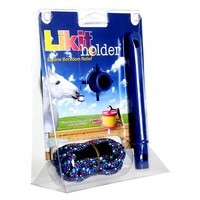 Likit Holders are the easiest way to start using Likit’s in your horses stable. Made from durable plastic with a strong colourful nylon rope, the holder can be hung freely in the stable and will move unpredictably to make your horse work harder for their reward. Likit Horse Licks sold separately.